28th July 2017 | filed under Aesthetic Treatments. There are many areas of our body that individuals may want to improve because they feel self-conscious about them. 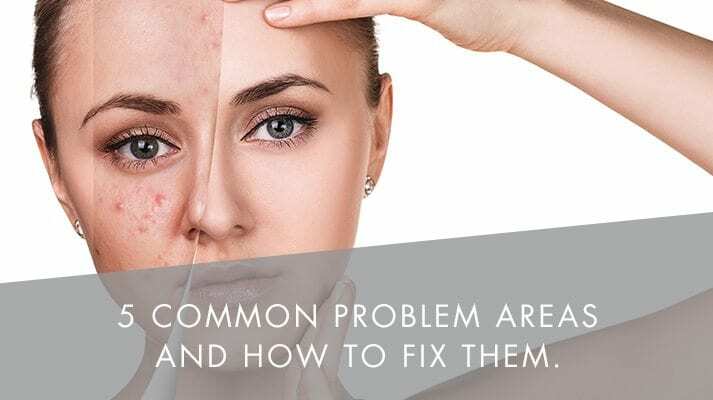 We often refer to these as being our “problem areas.” Problem areas are common, and are easily resolved with the right type of cosmetic surgery (surgical and non-surgical). At the Aesthetic Skin Clinic, we have made a list of five common problem areas and how you can overcome them to make yourself feel more body confident. Bacteria called Propionibacterium acnes, which causes redness and inflammation. Sticky skin cells that clog up pores. Too much of the hormone androgen in your body. It is vital to treat acne effectively and as early as possible to prevent acne scarring and other issues. At Aesthetic Skin Clinic, we aim to manage the majority of our patients using Obagi Skincare, topical applications, and Intracel Radiofrequency Microneedling. Obagi Medical is the world’s number one prescription skincare system used to treat and prevent acne at its root. Cellulite is a common affliction that affects both men and women. It occurs with all body shapes and sizes and is incredibly difficult to improve, regardless of rigorous exercise and good diet. Cellulite is characterised by its dimpled appearance and contour irregularities, and can be distressing for those who have it. Cellulite is a complex condition caused by changes to the skin and underlying fat and fibrous tissues. We have researched and sought out treatments that can make a real difference. One of the treatments we provide is Thermage CPT Body. This popular non-surgical and non-invasive treatment uses a unique and capacitive form of radiofrequency. Thermage CPT Body shaping heats the skin to stimulate existing collagen fibres, and creates new ones. After just one session, patients notice firmer, smoother, and more elastic skin. Hyperhidrosis is a common medical condition where a person sweats excessively. Although sweating is a normal response to heat, exercise, and anxiety, some individuals have a hypersensitivity of the glands, which produces excessive sweat, giving rise to physical and psychological disabling symptoms. Between 1-3 people in 100 live with the condition in the UK alone. Armpits, the palms of the hand, the groin region, the soles of the feet, and the face and chest are the most common areas affected by excessive sweating. This long-term condition can be managed successfully through a number of helpful treatments. Botox treatment for hyperhidrosis is a proven technique to temporarily reduce the amount of sweat in the treated areas. By injecting small amounts of botulinum toxin, we can effectively block nerves leading to the sweat gland, managing and relieving the issue with results lasting between 5-7 months. Stretch marks are formed from growth, fluctuating weight, hormonal changes, and pregnancy. Although they start off pink, they eventually turn a silver colour as they age. Treating stretch marks while they are still new enables a much better chance of reducing and improving their appearance. Both men and women can get stretch marks on several parts of their body, including the belly, thighs, hips, breast, upper arms, and lower back. There are several treatments for stretch marks, but none of them are 100% effective with the degree of success depending on your skin tone, age, and the amount of sun damage your skin has had. Microdermabrasion is a treatment used to treat stretch marks. This treatment removes superficial layers of skin to promote a more youthful and radiant glow. This non-invasive, anti-ageing treatment is suitable for all skin types. Stubborn fat is another problem area, and is common among men and women, with the tummy, thighs and buttocks being the main areas of concern. When we are born, we have a set of fat cells that are distributed around our bodies, immune to cell death, they fill up or shrink as our weight fluctuates. With a higher concentration in some areas, we often notice one stubborn fat area that simply won’t budge. A treatment we offer for stubborn fat is Fat Freezing. This medical technology is able to draw up and cool the body part you want to treat to a very low temperature without damaging the surrounding tissue. It is an efficient body treatment if you want to remove discrete unwanted fat bulges. Here at the Aesthetic Skin Clinic, our award-winning team carry out our advanced treatments to the highest standard. If you would like to find out more about the treatments we provide, get in touch with a member of our team today. Removing Stretch Marks: What Are the Options?